Have you calculated your net worth? You should, as it is the clearest and most exact measure of your economic status and the best way to assess your financial progress over time. We will explain what net worth is and teach you how to calculate and how to increase your net worth in the following lines. How Do You Calculate Net Worth? Common examples of liabilities are loans (personal loans, mortgage loans, car loans, student loans) and credit card debt. Although some intangible assets, like degrees and qualifications, may prove useful to someone looking for ways to increase net worth, they do not have an intrinsic value and should not be taken into account when calculating net worth. Before you start looking up advice on how to increase your net worth, you need to find out what your current net worth is. This way, after applying the tips for increasing net worth you come across, you can assess their effectiveness and the results of your efforts. Calculate the value of all your assets. Deduct the value of your liabilities from the value of your assets. 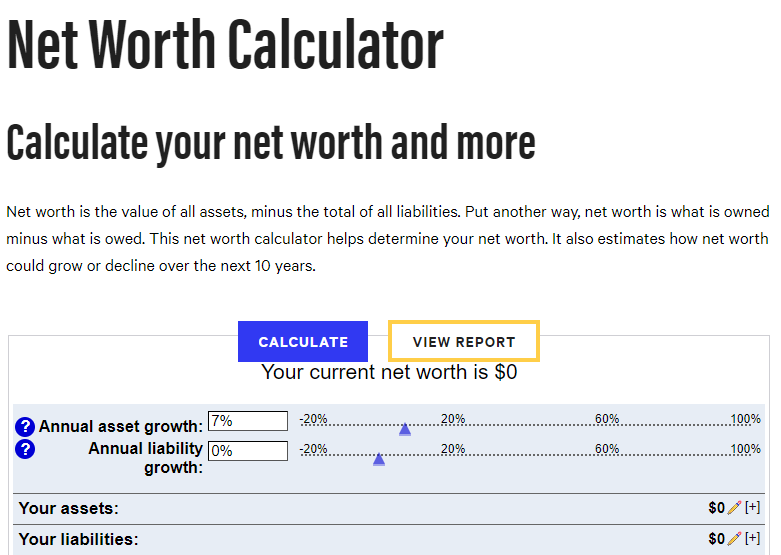 If you need help, Bankrate provides an easy to use calculator that you can try and very intuitive definitions that will come in handy on your quest to learn how to increase your net worth. When calculating your assets and liabilities, make sure you take into account their current market value, not the value they had when you acquired them. For example, if you own a home, its market value may be higher than the price you paid when you acquired it. When it comes to cars, their value usually drops with time and wear and tear. As far as your loans are concerned, you should take into account the amount the lender would request from you if you were to pay off your loan immediately. This amount may include potential early payment fees but should exclude the income you will pay if you continue with the loan according to the initial terms of the loan. Knowing your net worth can help you assess your current economic situation, compare yourself to others, and set goals. If your net worth is below the median, you can make the median your goal. Just don’t let your net worth define who you are, make it the start line of your race to financial freedom. According to the Federal Reserve’s 2016 Survey of Consumer Finances (the most recent one at the time of writing this guide), the mean net worth of a U.S. household is $692,100. Before you despair, keep in mind that this amount is heavily influenced by the super wealthy. A more realistic value would be the median net worth for U.S. households, of only $97,300. But a household includes all the persons leaving under the same roof so this value should not define your value as a person either. These numbers may seem a little overwhelming at first sight. However, they are actually modest. If you own a car and you have no debt, you’ve contributed to your retirement account for a few years, or you have some equity in your home, you can easily exceed the median. But this does not mean you should not aim higher. Most Americans have no retirement savings and do not own a home, and you surely want more from life. We’ll teach you how to obtain it in the following lines. As you get to it, remember that while building net worth in your twenties may not be a priority, the sooner you start, the higher your net worth will get over the years and the easier everything will be. Any of these ways to increase net worth will work. For example, if you save or earn money while your debts remain unchanged, your net worth will increase. It will also increase if you pay out your debts and keep your assets. However, it will all take time. If your goal is to learn how to increase your net worth fast, your best chance is to implement all these strategies at the same time. We will guide you through the process in the following lines. One of the easiest and most effective tips to increase net worth is to save money. Whether you use it to pay your debts, boost your retirement contributions, buy assets that maintain their value or invest every dollar you save will work towards increasing your net worth. There are many simple things you can do to save money. We will cover the money-saving strategies that work best and are easy to implement in the following lines. No one expects you to stop showering, washing your clothes, stay in the dark, stop watching TV, or not warm your home in the winter. You can enjoy the same comfort and pay less on your utility bills. All you have to do is negotiate lower bills and get rewards for responsible energy use. Do you sign up for free trials and forget to cancel? Perhaps you have subscriptions to magazines you no longer read or memberships you no longer use. You should cancel them as soon as possible. Every cent they withdraw from your account is another cent you could use to increase your net worth. There’s a bot that can help you track your expenses, negotiate lower bills, fight bank fees, cancel unused subscriptions, and schedule automatic transfers from your checking account to your savings account. It’s called Cushion, and you can read all about it here! Don’t forget that you found out about it while looking for advice on how to increase your net worth, so use the money it helps you save for your goal. I’m willing to bet you have credit card perks you don’t know about and never use and you pay a small fortune in fees for balance transfers and cash withdrawals, and interest for the balance your carry past the grace period. Study your credit cards’ terms and conditions and start using the right credit card in every situation, so as to obtain maximum benefits with minimum fees and interest. It is understandable that you do not have the time and patience to clip coupons from local newspapers and magazines. However, there are now mobile coupon apps that you can install and use to obtain the savings you need. If you need help finding the right ones for you, check out our list of 15 best coupon apps. Groceries, clothes, and transportation eat up most of your budget. The savings these expense categories allow are one of the best ways to increase net worth. We’ve already detailed how you can save up to $1,000 a month on groceries, save money on clothes, and get rewards when you fuel up your car in previous posts, so all you have to do is take a few minutes to read and follow our tips for increasing net worth. Some credit cards offer up to 5% cashback on the purchases you pay with them, so it pays to see which ones offer the most in every situation and use them accordingly. There are also websites and apps that can get you up to 20% cashback if you access the retailer’s website through their link or keep their browser extension active. That means you’ll eventually reduce your spending by up to 20%, and thus get another solution to your question of how to increase your net worth. You can get cashback for brick-and-mortar shopping as well. All you have to do is install an app like Drop on your smartphone and scan your receipts. There’s nothing more frustrating than discovering that the price of an item you bought dropped just after you completed your acquisition. However, there are solutions to recover the difference when that happens and use that difference to increase your net worth. Some credit cards offer price protection (Capital One Savor Cash Rewards, Wells Fargo Visa Signature, U.S. Bank Cash 365™ American Express, and all Citi credit cards) but leave it up to you to monitor prices and claim the difference. Keep in mind that apps like Shopkick can save you even more money by paying you to simply walk into stores! Take advantage of technology to automate your savings! Apps like Digit analyze your spending and find opportunities to save a small amount automatically every day, without you even feeling it. You can set savings goals and meet them with no effort. As mentioned above, saving money is only one of several ways to increase net worth. You can deposit the money you save in a savings or retirement account, use it to pay out your debts, buy assets that preserve their value, or invest it and earn even more. Let’s take a closer look at the other ways to increase net worth. Mortgage debt – All guides on how to improve net worth recommend making mortgage payments. That is because you not only diminish your liabilities but also build equity in your home, and, thus, increase your assets and net worth. Payday loans – These come next, as they accumulate the highest interests. Since they are usually a last resort solution, paying one does not guarantee you will not need another. To get the money you need when you need it and avoid the high interest, we recommend Earnin. Don’t disregard the idea of paying out your debt even if you live on a tight budget. Use Qoins to gather the money you need without even feeling it. Qoins will round up your payments and transfer those few cents to your savings account. When it reaches the limits you set, it makes payments to your debts. Learn more about it from our Qoins review here. Use money making apps. You can earn small amounts of money while doing stuff you already do, like walking or exercising, playing slots or Trivia, taking surveys, watching videos, browsing websites, visiting stores, shopping on Amazon, and more. Drive for Lyft or Uber. Even if you only take passengers on your way to or from work, during weekends or while running your own errands, every dollar you earn is another step towards your goal. You’ll be your own boss and make your own schedule, so there’s not much to complain about. Become an Airbnb host. All you need is a spare room, and you can easily make a few hundred dollars a month. Create an account, describe the room or apartment you have available, set your conditions, upload a few photos, and you’re good to go. Sell beauty products. You can focus on products you already know and use and earn a commission and various bonuses by referring them to your peers. You can sell anything from perfumes and makeup to detergents, health supplements, and personal care devices. Start a blog and monetize it. You can write about anything you know and like, and make money from advertising, endorsements, coaching, creating and selling digital products, and more. The best thing about blogging is that you get to do what you like, when and how you want. Deliver packages. It’s very similar to driving for ridesharing companies, except that you transport packages instead of people. If you’re worried about package size, value, or content, you can avoid mysteries and deliver restaurant orders with Postmates. Walk dogs with Rover. You can make some money while jogging or doing your power walk, going for a walk, or admiring the landscape. You can choose the race and the neighborhood, decide your fees, and make your own schedule, have a pet without actually caring for it. Babysit. Kids are adorable and a pleasure to be around. Many people would babysit for free. You can do it for money. You won’t even have to advertise your services by yourself. All you have to do is join a platform like UrbanSitter, create an account, and choose the offers you like. Become a Freelancer. If you have skills others would pay for, like copywriting, graphic design, web development, teaching, voice-over, and more, you can offer your services online to and make money from home, on your own terms. Don’t forget to check out our tax deductions guide for freelancers when it comes to reporting your income! Start a dropshipping business. If you’ve made habit of browsing stores even when you’re not looking to buy, this idea could work especially well for you. It involves creating an online storefront with your favorite products and forwarding orders to the corresponding manufacturers or retailers. You negotiate bulk prices with the manufacturers and retailers, your clients pay the retail price, and you get to keep the difference. Join the Amazon Affiliate Program. Affiliate marketing is all about driving sales and leads (subscriptions, free trials, inquiries, etc.) to specific merchants in exchange for a commission. Amazon is the greatest and easiest to promote merchant, but you can promote anything, from app and software to cosmetics, jewelry, healthcare products, insurance and legal services, and more. Start Your Own Service Business. If you’re good at what you do and tired of answering to others and working full time, you can start your own local business. You can get into roofing, cleaning, rentals, accounting, or anything else you know and love. The best thing about these money-making ideas is that most of them can easily turn into a side or even full-time business. They let you do what you like, set your own schedule, and earn according to the effort you put in. If you need help turning your occasional gig into a money-making business, check out our complete guide here! Believe it or not, net worth and retirement contributions go hand in hand. Your retirement accounts count as assets, so the higher their value is, the higher your net worth is. If you haven’t started to save money for your retirement, you should, as soon as possible. It is an excellent way to secure comfort and peace of mind for your golden years. The safest, most accessible, and most profitable retirement saving solutions are 401(k) and IRA accounts. We’ll discuss how to increase your net worth by contributing to them in the following lines. IRAs are individual retirement accounts. You can open them with your favorite bank or brokerage company. The money you deposit in them is insured, so you don’t risk losing it. You can invest it in stocks, ETFs, bonds, certificate deposits, and more, to help it grow. Contributors younger than 50 cannot contribute more than $6,000 in 2019, while contributors age 50 or older can contribute up to $7,000. There are several types of IRA accounts available, each with its pros and cons. Traditional IRAs are one of the best ways to increase net worth because contributions to them qualify as pre-tax. This means you can deduct them when filing your tax report. Thus, you not only increase your net worth by increasing your assets but you also diminish your income tax liabilities. Roth IRA contributions are subject to taxes. However, the distributions are not. In order to contribute to a ROTH IRA, your modified adjusted gross income cannot exceed $193,000 if you file your taxes jointly, with your spouse, or $122,000 if you file by yourself, as a single or as head of household. SEP IRA or Simplified Employee Pension accounts are a great option for the self-employed. If you have such an account, keep in mind that you 2019 contributions cannot exceed $56.000 or 20% of your income. SIMPLE IRA or the Savings Incentive Match Plan for Employees is an employer-sponsored plan with an employer matching incentive built in it. The employer has to match the contributions of their employee for up to 3% of the employee’s salary or pay a flat 2% of the salary no matter if the employee participates in the plan or not. The 2019 limits go up to $13,000 for employees up to 50 years of age and increase to $16,000 for contributors age 50 and older. Before opening your IRA account (if your employer has not opened one for you), check the terms and conditions of several banks, to make sure you get the lowest fees and the highest returns. Every percentage added to or deducted from your IRA account will influence your net worth. If your employee has engaged to match your contributions, take advantage of their offer. Contribute at least the same amount they committed to match, so as to double your retirement savings and boost your net worth. Employers are the ones to start 401(k) accounts. Although many employees choose to cash their savings when they stop working for the employer that started the account, our research suggests that holding on to the account and continuing to contribute to it could be beneficial. For 2019, contributions to 401(k) accounts are limited to $19,000 for contributors up to 50 years of age and $25,000 for contributors who are 50 years old or older. There are two types of 401(k) accounts, and they have a lot in common with their IRA correspondent. Traditional 401(k) accounts rely on pre-tax money, so they make an excellent choice for increasing net worth from both tax savings and returns. Roth 401(k) contributions are subject to taxes but their distributions are not. Both types of accounts allow employers to match all or some of their employees’ contributions. Enrollment is automatic, initiated by the employer for both account types and employees can start contributing immediately. Compared to IRA accounts, 401(k) accounts offer fewer investment options. Some accounts impose gradual increases in contributions, so those planning to contribute an increasing amount every month will have to take care of the increase themselves. As with IRA accounts, the key to increasing net worth is to contribute. This is especially true when your employee commits to offer a matching contribution of at least 50% (make sure they have something to match). If you can, avoid early cash-outs and borrowing from your retirement savings. Finally, if you want to boost your retirement savings and, with them, your net worth savings, consider trusting Blooom with the management of your 401(k). Read more about how this app works and what it can do for you here! We mentioned above that net worth calculations rely on asset value. It should be easy to understand that, if you want your net worth to increase or at least remain the same, you need assets that do not drop in value over time. It is up to you to discover what these are and from where to get them at best prices. However, we consider it our duty to help you get started. Here are some ideas of assets that make a great investment for those looking for ideas on how to improve net worth. Not all investors or art collectors are in it because they love art. Many have chosen this investment field because they know there’s money involved. Fine art will always have buyers willing to pay a higher price. Also, when you have enough pieces, whether painting, sculptures, or ceramics, you can open your own gallery or lease your masterpieces to famous galleries. If you’re not yet convinced that fine art makes a worthwhile investment, know that the value of the global art market increased from 57 billion in 2017 to 64 billion in 2017. Similarly, the global sales volume increased from a little 36 million in 2016 to approximately 39 million in 2017. Investing in real estate property has always been a great idea, leaving the 2008 financial crisis aside. For example, if you look at the S&P Case Shiller U.S. National Home Price Index, you will see that it has been rising constantly since December 2011 and it is more than double compared to 2000. Its value was 100 in January 2000, and values past this date reflect price fluctuations. At the end of 2018, the S&P Case Shiller National Home Price Index was 205.35 in 2018, meaning that house prices had increased by 105.35% compared to 2000. If you are worried that prices may drop, consider investing in exclusive properties. Look for rare, historical, unique buildings that are rarely available but could stir interest. These are more likely to maintain their value over time. 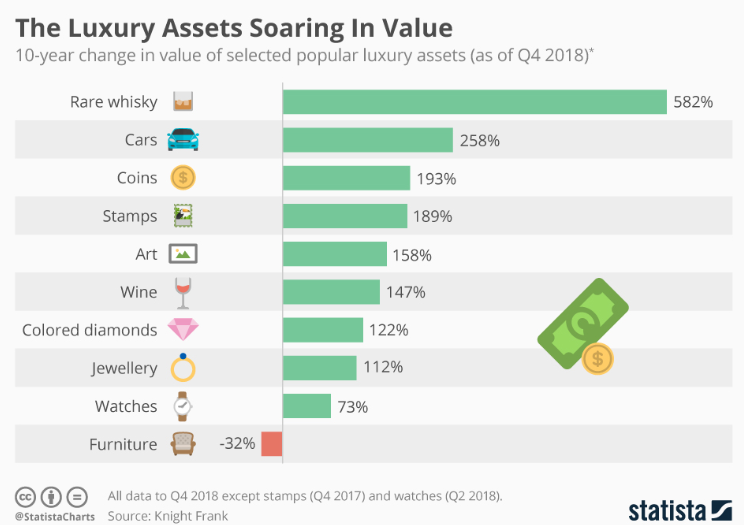 If you still have doubts about the investment worthiness of luxury assets, take a look at the chart below, reflecting their ten-year change in value, taken over from Statista. As you may already know, gold has been a favorite investment opportunity for the wealthy for centuries. Fine gold is the form that offers the highest return. It is almost pure gold (99.9+% gold mass), also known as 24-carat gold. Its price is set by the London Gold Market Fixing Ltd that Barclays undertook a while ago, twice a day, according to the balance between supply and demand. While prices do fluctuate over short periods, in the long run, fine gold remains one of the most profitable investment options. 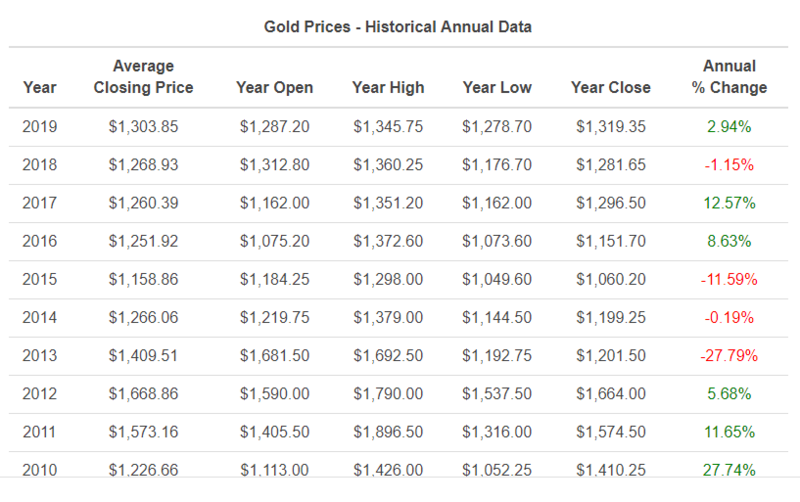 With few and small exceptions, the average annual price of gold followed an ascending path, visible in the below chart, taken over from Macrotrends. Now you have a starting point for your research on assets that preserve their value or, better yet, increase it over time. But what if you don’t want to keep your money blocked in such assets or you hope of a higher return? There are still many investment opportunities you can try. There are numerous investment opportunities out there, and only you can choose the ones that will work best for you. While some of them are quite eccentric (we saw recommendations for racehorse partnerships) others are common sense options any financial advisor would recommend to their client. These are basically company shares. They can help you increase your net worth by increasing their price and paying you dividends. However, their return depends on the market evolution of the company whose shares you buy and on how others perceive the company. If the price of your stocks drops, you will inherently lose money. That is why you should only consider stocks as an investment if you can commit to monitoring their evolution so as to trade accordingly, or you have a stockbroker you can trust. You can think of them as loans you provide to various corporations or the government. They come with fix interest rates payable every six or twelve months. When choosing the bonds to invest in, you should look into their associated credit risk. The safest bonds to invest in are government bills and bonds issued by the treasury. If you’re considering investing in corporate bonds and you want to minimize risks, choose the ones with the highest Moody and Standard & Poor ratings, namely Aaa and, respectively, AAA. Besides investing in real estate property as assets that preserve their value, you can invest in real estate projects, flip properties, or buy into rental properties. If you decide to invest in real estate projects, you can start with amounts as low as $500. If you are worried that researching the market would take too much time and effort, you can always use your way into this type of investments with technology. We have a list of the best real estate investing apps here. For even more valuable advice, check out our 27 real estate investing tricks for beginners! These are the perfect alternative to cryptocurrencies and stocks or bonds. They are digital tokens backed by real-life assets and subject to SEC regulations. They can help you increase your net worth by dividends, interest, and profit shares. You can buy them directly from the issuer or trade them on exchange platforms. The great thing about security tokens is that, while trading can be a little complicating, involving the use of cryptocoins and accounts on various platforms, the risks are low and the returns are considerable. You’ve surely heard of cryptocurrencies like bitcoin and ethereum by now. You hopefully know they make risky investments and, just like stocks, require careful monitoring to avoid or diminish losses. However, they could very well be your ticket to a higher net worth fast. To minimize risks and secure an increase in your net worth, you should look into ways to earn free cryptocoins. Our buying guide may come in handy if you plan to trade bitcoin. But there are many more ways to make money with cryptocurrency. Fundrise and Roofstock rule the real estate investments market. Ally Invest and Betterment are an excellent alternative for stock trading. Binance and Coinbase take the guesswork out of cryptocurrency trading. Just in case you have no money to invest or you want to simplify things even more, you should try Acorns! Just like Qoins, it rounds up your payments but, instead of using it to pay your debt, it invests it in the stock market. It is one of the easiest ways to increase net worth at any age and surely the best way to start building net worth in your twenties, and we’ve covered everything you need to know about it in our Acorns review here. But don’t take our advice for granted! Put it to the test and let us know how it went. Also, don’t hesitate to share your own ideas on how to increase your net worth fast in a comment below!